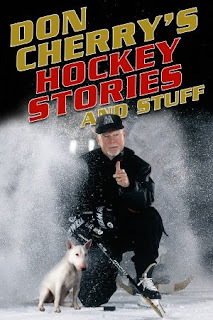 If you watched Coach's Corner on Hockey Night In Canada on Saturday you saw Don Cherry hawking his new book Don Cherry's Stories & Stuff. The book is released today, October 28th. I previewed the release this past summer, but there is an even better preview available online every day this week at the Globe & Mail's website. The Globe is publishing excerpts of the Cherry's new book, and I have to admit I'm impressed. I really wasn't sure what to expect from a book called "Stories & Stuff," especially one written by Al Strachan of all people. But it looks like Grapes clears the air on more than a few occasions. It's far more than just rock 'em, sock 'em on paper. I'll post more as the days go on.